The Berlin Wall came down in 1989 and I missed it. I was studying in Tübingen, (West) Germany, at the time so you’d think I would have been well positioned on November 9 when Günter Schabowski from the East German politburo announced that the border was open. So what do you think I did when I heard my landlord shout from the living room that his wife and I should come quickly to the TV, that history was being made? I ignored him. I didn’t pay a lot of attention to him, and what I did hear, I didn’t really believe would last. His wife and I continued our conversation in an adjacent room and the wall came down without us. Of course, over the days following, I realized that the events of November 9 were real and would likely have lasting effect. I quickly caught up to and immersed myself in the occurrences of those weeks and months. Soon thereafter, I went to Berlin, where I crossed the border several times myself with only perfunctory checks by the nonplussed guards. 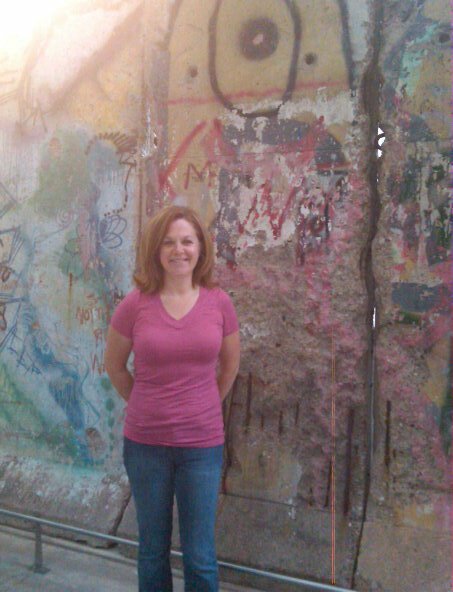 I smuggled out East German marks and brought home my own piece of the wall. I heard a saying recently that fits this situation perfectly: be open to the moment. That night in Tübingen, I had closed myself off from possibility and let history slide by. It wasn’t until much later in my life that I understood that my lack of participation that night could teach me a greater lesson. I can’t let myself get so wrapped up in my plans or my current activity that I miss an opportunity of greater value. These opportunities can be big or small. They can be at work or at home. The important thing is that I remember to look around once in a while and be open to the moment. Thanks for that story. I’ve become depressed lately (partially by reading about you traveling and other circumstances…it’s not you though Tammy;) so I’ve taken it upon myself to be mobile again. I spend way too much time in my cocoon because I’m afraid I’ll get too far outside my comfort zone and get stuck. Well now I’m trying to make that less frightening and carpe diem is in my head. Tomorrow it starts: Indianapolis; later I’ll go further. Thank you for sharing snippets of your fabulous mind. Thanks, Pam. I’m glad to have you peeking in at my blog. I definitely think there’s a difference between living in the moment and being open to the moment, and you often can’t accomplish the former without the latter. As with so many things, it really boils down to attitude!